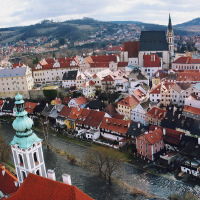 Located about 18 miles away from Ceske Budejovice, Ceske Krumlov is one of Bohemia`s most beautiful towns, a compulsory stop in your visit to South Bohemia. 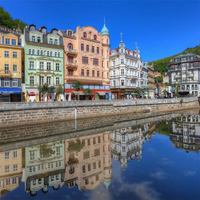 In 1992 the town was rewarded for its historic importance and physical beauty with a place on the UNESCO`s World Heritage list. 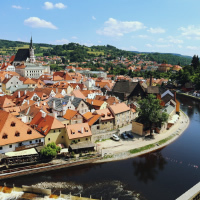 Ceske Krumlov is a living gallery of elegant Renaissance-era buildings housing charming cafes, pubs, restaurants, shops, and galleries. 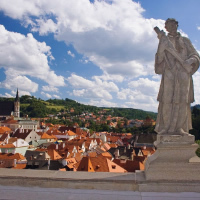 The main tourist attraction is the Krumlov Castle, the second castle complex after Prague`s Hradèany castle. Krumlov Castle contains a preserved Baroque theatre, complete with original stage machinery, scenery and props: one of only a few such theatres that still exist.